Each month we focus on raising financial support for an individual mission. We are partners in supporting Sue through the Mission Society. Sue Kolljeski serves in northern Ghana, West Africa. She co-pastors Kalsagri Church and teaches reading skills to preschool and elementary-aged children in Lawra, Ghana. She previously led a ministry to disabled children, which is now run by nationals. Agape Family Shelter is a branch of the Lebanon Rescue Mission that provides shelter, food, and counseling for homeless women and their children. We give financial support through a special offering. 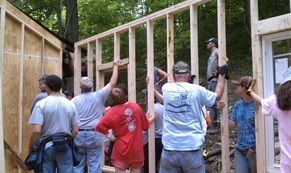 Through the Heart and Hand Ministry, annually we travel to Barbour County, WV in order to provide hands-on assistance with home repairs and building projects that will provide low income families with safe, affordable and adequate housing. Gretna Glen is blessed to provide a place apart that transforms lives. Each year we host 10,000 summer campers, volunteers, school group students and retreat guests. We are so grateful that this 200 acres is set aside for opportunities for children, youth, and adults to grow closer to nature, build relationships, and grow in their faith. Gretna Glen is a Christian Camp and Retreat Center located just east of Hershey, PA amidst the beautiful forest and stream of Mt. 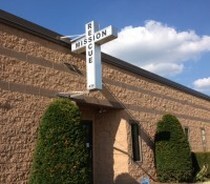 Gretna, PA.
DiscipleMakers is a Christian campus ministry based in Pennsylvania. Our goal is to raise up the next generation of leasers for the church by training college students in Bible study, gospel-driven discipleship, and evangelism. LCCM provides food, clothing, emergency fuel, etc. to families in Lebanon County on a temporary need basis. Once a month volunteers from our congregation prepare and serve a noon meal to needy people in the city of Lebanon. Our congregation collects necessities, and provides support through our membership affiliation. We give additional financial support through a special offering. 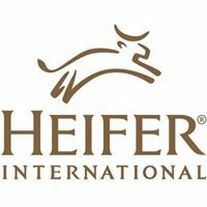 We also participate in the emergency shelter program offering our Fellowship Hall to act as an overnight shelter for the homeless two weeks every winter and spring. 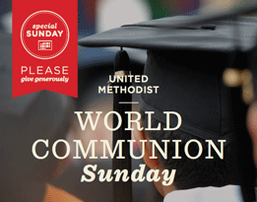 World Communion provides scholarships and grants to racial and ethnic-minority students for ministerial studies. Family Life Counseling Center (FLCC) in Tanzania, Africa began with the vision of Lucas and Limi Ndaro and is now being run by Dennis and Mary Mashiku. In 2010, CUMC raised funds and sent a mission team to Tanzania to assist in the physical construction of the FLCC. The center provided a successful entrepreneurial seminar and serves as a center for marriage and family counseling, HIV/AIDS counseling, microfinance counseling, parenting and spiritual growth. We are committed to continue to financially and prayerfully support the ministry as it grows to serve the emotional, physical, spiritual and financial needs of the local community in Nassa. Cornwall Church has lent our support both physically and financially to mission work sites throughout the world. 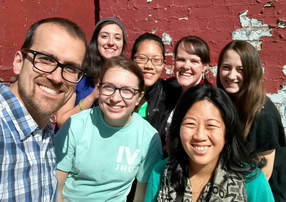 Our members have traveled to distant locales - including Africa, Jamaica, Granada and Puerto Rico as well as within the country such as to the Gulf coast of Georgia and East Coast of Maryland for Hurricane recovery - to personally work on projects with the local people and ministries. This unique mission program helps the poor to help themselves by providing a source of income to feed their families. Animals, along with instructions in their care, are given to needy families all over the world. The first offspring are given away to other poor families in order to help them prosper. We feature this mission at Christmas as a part of our annual Alternative Gift Market.